Winter Park is a hidden gem of a resort, not yet well known in Europe, but is known as "Colorado's Favourite". With its uncrowded slopes, 300 days of sunshine per year & consistently high snowfall, it's not a resort to be missed! Winter Park ski resort what's new? Reconfiguration of the Village Way Trail, providing a new and easy way to the base for beginners. 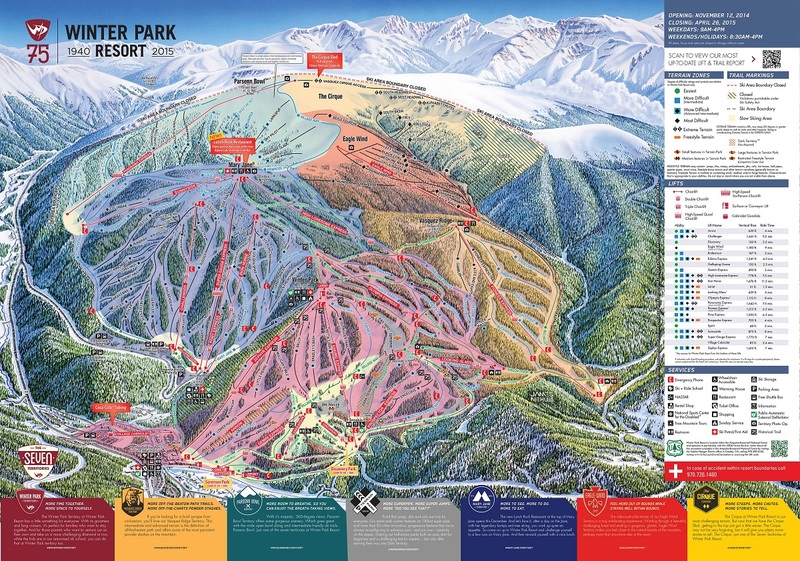 5 interlinked mountains with 7 territories: Winter Park, Mary Jane, Parsenn Bowl, Eagle Wind, Vaquez Ridge, The Cirque & Terrain Parks. Beginners will learn to ski or ride in Sorensen Park, safe at the bottom of the mountain, before progressing quickly to "Discovery Park", an area mid-mountain cordoned off from more advanced skiers, allowing you to practice in a safe and secure environment. 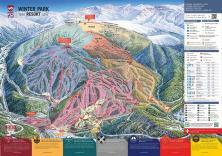 Intermediates will adore cruising the blues & blue blacks (reds) on Winter Park Mountain and Vasquez Ridge. Parsenn Bowl gives intermediates a rare opportunity to try bowl and powder skiing. For more Advanced skiers, there are the chutes, steeps & glades of Vasquez Cirque or the world-renowned long bump runs on Mary Jane. The locals call it "No Jane, No Pain" for good reason! For untouched, unpisted, natural off piste in bounds terrain try the rustic Eagle Wind trails & lift. Terrain Parks The Starter Park is designed for the beginner-jibber. This park features small boxes perfect for those first attempts at rail sliding. Dog Patch offers skiers & riders an intermediate park system ideal for perfecting skills. Dog Patch East offers a variety of non-traditional jib features for skiers & riders. Rail Yard, Winter Park's advanced terrain, features a combination of rails & jumps with perfect flow, plus a 420 ft superpipe. Dark Territory, Rail Yard's limited access area, continues to evolve with more unique features including two new jump lines, a variety of rails, boxes & manmade jibs. The 25 lifts are nearly all chairlifts offering comfort & relaxation. There are: 1 x cabriolet, 2 x high speed 6-packs, 7 x high-speed express quads, 4 x triple chairlifts, 6 x double chairlifts, 3 surface lift, 1 x platter & 1 x rope tow. Nightlife in Winter Park is fairly low key with mellow bars & restaurants with some live music. At the resort, the Derailer Bar has Happy Hour every afternoon, the perfect place for an after skiing "Snuggler" or "Broken Leg" cocktail. In central Winter Park enjoy a drink in one of the many bars: The Winter Park Pub is a popular locals hang out, whilst Ullrs and Smokin' Moes often have live music & Ullrs has pool tables & darts. More than 30 local restaurants offer a variety of cuisine: Volarios Italian, Carlos and Maria's Mexican, Hernando's family pizza pub, Deno's Mountain Bistro & Fontenots Cajun Cuisine. For a special occasion the cuisine & mountain views at Devil's Thumb Ranch are out of this world. Hot Sulphur Springs - Where the Ute Indians once bathed, healed mind, body, & spirit & relaxed in sacred waters... There are now 22 pools & private baths plus a new jet spa, outdoor oriental bath & solarium pool. Or relax with a massage or body wrap. Snowmobiling - Take a snowmobile trip, guided or unguided & enjoy miles of pristine trails & spectacular mountain views. Sleigh rides - Nothing puts the magic into the holiday season like a good ol' fashioned sleigh ride. Enjoy a warm cup of hot chocolate as you dash through the snow! Dog sled rides - Enjoy a dog sled trip pulled by eight Siberian and Alaskan huskies through the backcountry of Winter Park. Hot air balloon rides - Spectacular flights over Winter Park year-round. See a bird's eye view of all the beautiful mountains, lakes, rivers, & forests. Tubing - Whizz down the slopes on inner tubes. Ice skating - Outdoor & covered ice rinks with skates for hire.